This article outlines the steps to take to perform Virtual connect (FlexFabrics) backup. 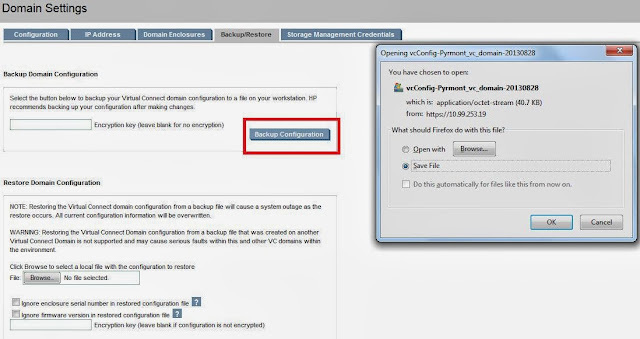 There are other ways to back up the configuration; one is through Graphical User Interface (GUI) as mentioned in the article and other way to through CLI. I have performed these steps in HP Virtual connect version 3.75. I have followed following steps to make sure that my backup and restore process is working. Please refer this link for steps to restore HP VC throughGUI. Please share on social media if you found this post helpful. If you have a comment or question, please post and add your voice to the conversation.